The most recent storm system dropped one to three inches of snow on the Denver area and across the I-25 Corridor. Skies are partly cloudy on the plains, but snow lingers in the northern and central mountains where another 3 to 6 inches will fall through Friday morning. DENVER — The most recent storm system dropped one to three inches of snow on the Denver area and across the I-25 Corridor. Skies are partly cloudy on the plains, but snow lingers in the northern and central mountains where another 3 to 6 inches will fall through Friday morning. There will now be a brief break in the snow pattern, aside from some scattered snow showers in the mountains Friday. Temperatures will be chilly, with lows in the teens on the plains and ranging from 10 below to 10 above in the mountains. 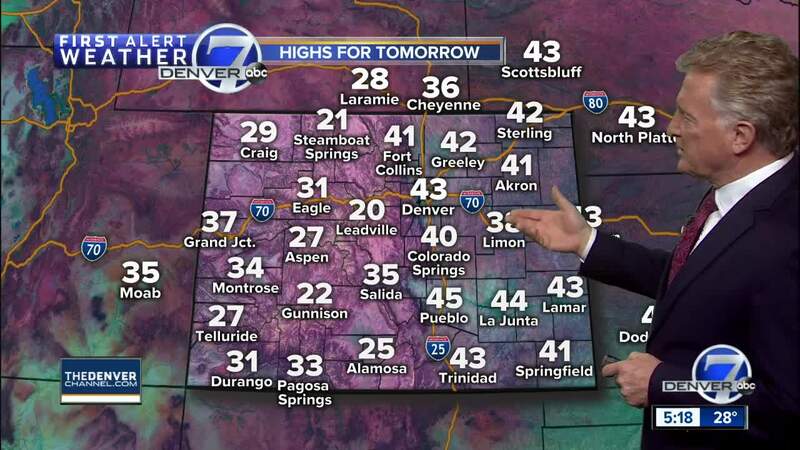 Friday will be milder as highs reach the low to mid-40s in the Denver area. In the mountains, reading will be in the 20s to low 30s. Saturday through Sunday should be milder and drier across the state. 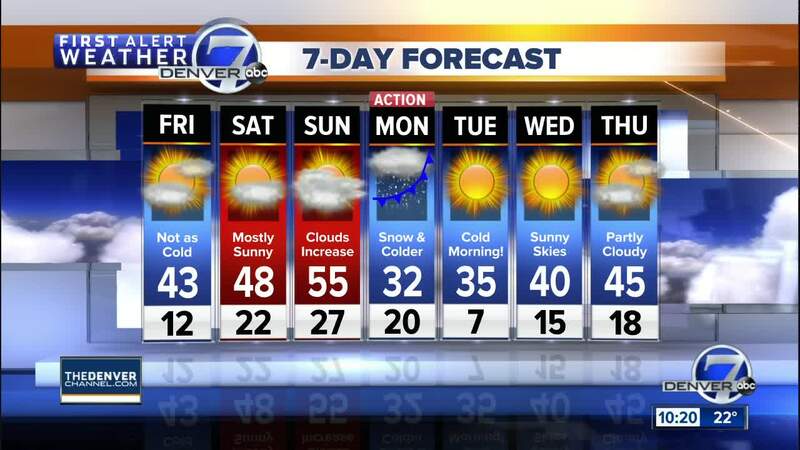 Highs will reach the upper 40s in Denver Saturday with low to mid-50s expected on Sunday. In the mountains, a few snow showers can be expected, but it will be milder with highs in the low to middle 30s. By Sunday night and Monday, another cold front will arrive with a chance for heavy snow in the mountains and a few inches of snow for Denver. Expect the Monday morning commute to be snowy and slow. Temperatures will be much colder again with highs in the teens and 20s in the mountains and upper 20s to low 30s in Denver. The cold front that will hit Colorado on Monday will be part of a much advertised "polar express" air mass that will engulf the Midwest and the East with bitter cold next week. Colorado will be on the western edge of the arctic invasion, so we will not get the brunt of the extreme cold - just a taste! Keep up with the latest on traffic and road conditions with our live blog .